From State Highway 1 heading south (towards Timaru) at the roundabout by the Ashburton Domain take the 3rd exit onto Walnut Avenue. Traveling north towards Christchurch along SH1 as you pass the Ashburton Domain you'll come to a roundabout. Take the 1st exit onto Walnut Avenue. Now traveling west (towards the mountains) along Walnut Avenue you will come to another roundabout. Take the 2nd exit onto Harrison Street. You should still be heading in the same general direction. After traveling west along Harrison Street for a short distance you will see the Allenton Shops approaching. Just before the shops Allison Street is on the South (left hand) Side. Turn onto Allison Street and The Green Gecko holiday home is 5th house back from the shops on the west (right) side. Look for low green fence with Geckos on it. 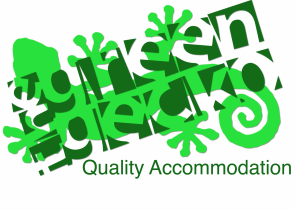 Ashburton Accommodation - The Green Gecko Holiday Home - Ashburton, NZ.